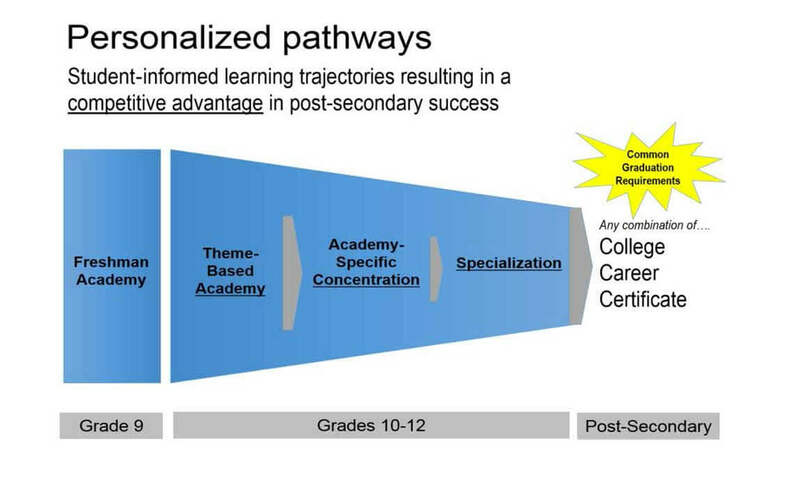 Students’ interests drive their paths providing them with opportunities to learn high school content and develop career and college readiness skills through a personalized plan of study. As students progress through the grades, their experiences can become increasingly personalized as shown in Exhibit 3. The primary aim of academies is to connect with student interest. The academies also align with career options in the region and Massachusetts, with research reports in mind such as Pathways to Prosperity: Meeting the Challenge of Preparing Young Americans for the 21st century and Degrees of Urgency: Why Massachusetts Needs More College Graduates Now. Symonds, William C., Robert Schwartz, and Ronald F. Ferguson. 2011. Pathways to prosperity: Meeting the challenge of preparing young Americans for the 21st century. Cambridge, MA: Pathways to Prosperity Project, Harvard University Graduate School of Education. The Vision Project. 2014. Degrees of Urgency: Why Massachusetts Needs More College Graduates Now. Download at http://www.mass.edu/visionproject/degreesofurgency.asp.